People living close to the English coast have higher vitamin D levels on average than those living inland, according to a new study based on the 1958 National Child Development Study. The research was conducted by the University of Exeter Medical School in partnership with the Met Office. The study was the first to link information on sunlight and vitamin D levels with detailed geographical information. The team used records from more than 7,000 participants of the National Child Development Studyand grouped individuals according to their distance from the coast. They also compiled detailed sunlight data from satellites and ground-based measurements. This information was then compared to levels of vitamin D of participants who lived close to the coast, and those who lived inland. The researchers adjusted their findings to account for other factors that can affect vitamin D levels, such as sunscreen use, outdoor activity, and diet. Previous research has shown that populations living by the coast may have improved health and wellbeing, and may even have lower stress levels than inland dwellers. This could be because it is easier to be physically active by the seaside, which can increase people’s positive mood. The team believe their findings could be an important piece in the health and wellbeing jigsaw. 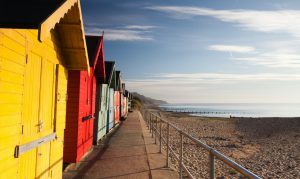 Exposure to sunlight is essential for vitamin D production, and the research found that English coasts usually see more sunlight on a yearly basis than inland areas. Vitamin D is important for maintaining a healthy immune system and bones. It is also believed to help prevent diseases such as eczema and asthma. The researchers point out that whilst prolonged sun exposure can increase vitamin D levels, it can also heighten risks of skin cancer. Most of the body’s vitamin D is formed when sunlight falls on our skin, but small amounts are also found in foods like eggs, cheese and oily fish.